Shopping for a new GMC Sierra 1500? Denali trucks carry big price tags to match their luxury gear: we’d start with a Sierra SLT with automatic emergency braking and the smaller V-8, and add a few personal touches to keep prices in good trim. The 2019 GMC Sierra steers out of the max-tow race; instead, it puts its marker down on smart and easy-to-use technology. With the 2019 Sierra, GMC has a truck that falls shy of maximum capability, but looks to cameras and software to optimize the truck experience. 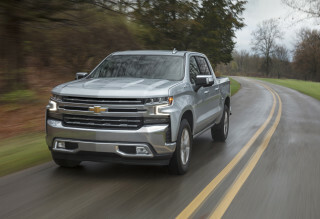 It also counts on a unique, versatile six-way tailgate and a carbon-fiber bed to score tech and utility points away from its stablemate, the 2019 Chevrolet Silverado 1500. This year’s Sierra scores well in utility and features, but fuel economy hasn’t really improved in the versions that go on sale by late 2018. The 2019 Sierra sticks with styling that's more conservative than the new Silverado, by a slim margin. 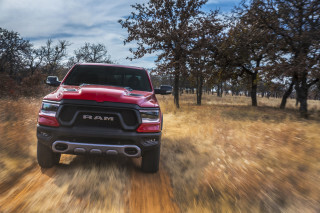 The conventional shape wears a supersized grille and headlights and taillights, like every other full-size pickup on the road today. The interior’s dominated by a shield-shaped stack of controls, with lots of brightwork on Denali models, which also wear discreet panels of open-pore wood and metallic trim for a discreet high-end look. The Sierra carries over two engines for the new generation. Eventually, the lineup will include gas and turbodiesel 6-cylinders and a new turbo-4, but for now the Sierra draws power from an amply muscular 355-horsepower 5.3-liter V-8 or a 6.2-liter V-8 with a terrific 420 hp. With 8- and 10-speed automatic to handle shifting invisibly, the Sierra’s straight-line performance crackles with capability. Its ride and handling strike a better balance than the bobbly ride of an F-150, but shod with its biggest 22-inch wheels, the Sierra gets mildly jittery despite a set of adaptive shocks. In its most capable forms, the Sierra can carry 2,240 pounds in its bed and can tow up to 12,200 pounds. The former number’s up, the latter’s lower this year. GMC says anyone that wants max towing can opt into its heavy-duty trucks—but Ford might sway them instead with a 13,200-pound-rated F-150, too. The new Sierra has a much more accommodating rear seat, thanks to nearly 3 additional inches of interior space. It also offers two unique touches that can’t be found anywhere else. A new carbon-fiber bed will be an option, and GMC says it’s tougher and lighter than the beds in some rivals but it hasn’t priced it or said when it will go on sale. More useful and standard on top Sierra trims is a new two-piece tailgate that can swing and fold in two sections for easier loading, to hold in longer payload, even to turn itself into a tailgater’s dream bench seat. Safety data isn’t in, but the new Sierra does offer touches like blind-spot monitors and a rear mirror camera. Automatic emergency braking, a key new safety feature, only can be ordered as an option on the most expensive Sierras, though. 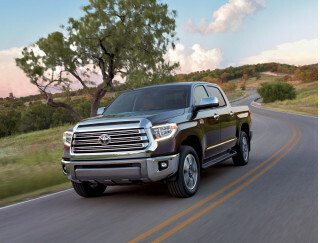 Base trucks get power windows and Bluetooth and a 7.0-inch touchscreen with Android Auto and Apple CarPlay compatibility; the plushest Denali has cooled front seats, heated rear seats, a trailer camera display that provides drivers with virtual eyeballs on payload and trailer hitching, Bose audio, and the ability to broadcast its own wi-fi network. The 2018 GMC Sierra doesn't spend much effort on dramatic style. GMC clearly has zero interest in changing the fundamental appeal of a well-designed pickup truck. The 2019 Sierra wears simple lines with few rounded corners and lots of straight edges, while it pampers passengers in its cabin with low-key luxury. GMC adopts more conservative styling than Chevy does with the related 2019 Silverado. On the Sierra, a big chrome grille cuts tapers as it drops between big C-shaped headlights, LED on some models. It meets up with a lower valance that gives it the appearance of a squared-off jaw, or a vise clamp. Various Sierra pickups can wear huge dollops of chrome (Denali) or body-color trim (Elevation) that can either overemphasize or tone down the truck’s big fog light openings and its high bumper lines. Down the sides of the Sierra, thin unpainted gray plastic outlines the wheel wells cut away some of the visual heft. A slight upward kink at the back of crew-cab rear windows breaks up a shoulder line that’s otherwise as long and straight as a Midwestern horizon. C-shaped taillights finish off the rear end, which wear a huge GMC logo that’s almost matched in front size with “Denali” on those models, all of which can be sliced and diced by the cutlines of GMC’s unique six-way folding tailgate. The body’s nearly as busy as the truck will be for years to come. Inside, the Sierra's interior shares its design with the Silverado, albeit with some trim changes and an exclusive head-up display. A massive shield-shaped panel ropes off most of the center stack of controls for audio and climate. On the range-topping Sierra Denali, an 8.0-inch touchscreen for infotainment is standard. Sierra Denali trucks will also feature leather upholstery, open-pore real wood trim, dark-finish aluminum trim. Towing and gas mileage are down, but the 2019 GMC Sierra still has exceptional strength to match its utility. 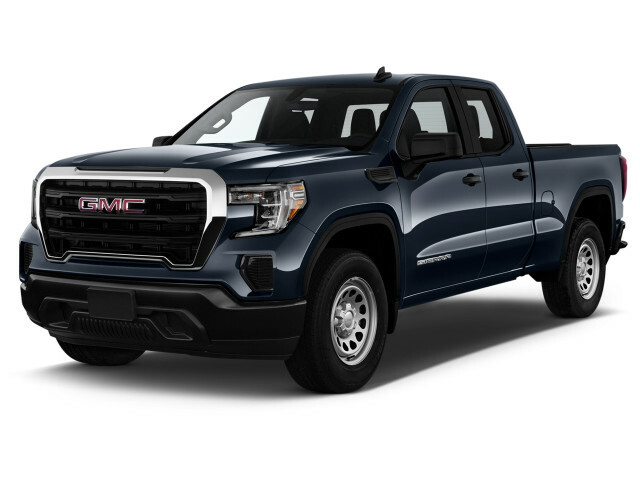 The 2019 GMC Sierra can’t match the class leader for tow capacity or outright acceleration, but it’s a smart update to GMC’s classic pickup performance formula. A panoply of powertrains will eventually power the Sierra truck family, from a turbo-4 to a turbodiesel inline-6 to a gas V-6. When it goes on sale late in 2018, the 2019 Sierra will carry over two V-8 engines. The 5.3-liter V-8 tunes in 355 hp and 383 lb-ft of torque, and couples to an 8-speed automatic, with either rear- or four-wheel drive. It’s beyond adequate. The smaller-displacement V-8 burbles happily off the line, pulls strongly even when the Sierra’s bed is loaded with hundreds of pounds of cargo, and its 8-speed automatic shifts imperceptibly. GMC says that the Sierra’s truck body weighs up to 360 pounds less this year, too, over a range from 4,351 to 5,015 pounds. Sierra shoppers with few restraints can spend into an even more muscular powertrain. It pairs a 6.2-liter V-8 with a 10-speed automatic. 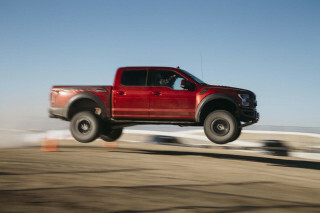 It’s not a Raptor in terms of visceral anger toward the earth, but the big V-8 throws off an easy 420 hp and 460 lb-ft of torque, and floats through its forward gears with ease. The bigger V-8 sets all kinds of thirst traps, for those who tow and for those who love visiting the fuel pump. That’s one of the downsides of this lighter, more mechanically complex Sierra. For all its nods to multi-speed transmissions, stop/start and gas-shutoff technology, it doesn’t get better fuel economy in most cases (more on that later), and it tows less than before. GMC says the new Sierra has a maximum payload of 2,240 pounds in regular-cab trucks with four-wheel drive; max tow is set at 12,200 in extended-cab 4WD trucks, some 300 pounds lower than last year’s model and 1000 pounds lower than the top Ford F-150. GMC says buyers who really need those tow numbers look at their heavy-duty trucks instead, but that’s an idea in conflict with GMC’s “professional-grade” taglines. Most Sierras come with a typical suspension setup–coil-over shocks in front, a leaf spring rear–and electric power steering. Top versions can be fitted with adaptive shocks, and wheel sizes range from 17 to 22 inches. Our initial test drive came mostly behind the wheel of Denali Sierras with the 6.2-liter V-8, adaptive shocks, and 22-inch wheels. We did make a short trip in a Sierra SLT outfitted with the 5.3-liter V-8, the standard suspension, and 20-inch wheels. It’s perfectly suitable for almost any full-size truck need. It’s less lavishly equipped, but this Sierra steers wells, and ride quality on every surface from flinty, buckled roads to sandy beach turnouts didn’t lack for composure or compliance. It’s less jouncy than some F-150s we’ve driven, less jittery and overly firm than past Ram 1500s with that truck’s available air springs. Compared to the Sierra Denali with oversized 22-inch tires, some might even prefer the lower-cost solution. The adaptive shocks on the Denali are no longer magnetically controlled, but their adaptive valving exercises more fine control over the Sierra’s suspension nerves. They can also add more ride damping when the pickup bed carries more than 550 pounds of payload. Those big 22-inch wheels throw lots of impact force back into the truck, and offset the gains of the more complex electronically controlled shocks. A more optimal setup might run on the 20-inch wheels and tires, but we haven’t sampled that combination yet. We’ll update this section as we drive more Sierra versions to come. The 2019 GMC Sierra boosts interior space and bed utility, and its six-way tailgate sets a new flexibility standard. The 2019 Sierra comes in regular, extended, and crew cab styles, with bed lengths of 5 feet 8 inches, 6 feet 6 inches, and 8 feet. The 2019 Sierra comes in two overall lengths; regular cabs have a 126.5-inch wheelbase, while extended-cab and crew-cab Sierras ride on a 147.4-inch wheelbase. GMC says the longer-wheelbase model has nearly 3 inches more rear-seat leg room. We’ve only driven crew-cab Sierras with front bucket seats, and have rated it based on that model since it’s the most popular body style. Space is hardly a concern in the four-door Sierra. It’s a bg truck with expansive front-seat space, wide enough to hold three passengers across when fitted with a bench seat. GMC sells more with 10-way power front buckets split by a center console; the buckets have flat cushions with low but firm bolsters. They’re comfortable over long drives, offer heating and cooling, and the design creates more head room than in the last-generation Sierra. The center console can hold a laptop or file folders, and most versions have ready access to charge points and even wireless smartphone charging. The Sierra’s crew-cab rear seats benefit from wide door openings and that nearly 3-inch boost in leg room. Now there’s plenty of spread-out space, enough for back-seat passengers to cross leg over knee. The rear seats don’t recline, but their backrests no longer sit bolt upright as in some older GM pickups. The seat bottoms flip up to increase storage space, and come with a fold-down armrest, accessible charge points, even seat heaters. GMC doesn’t use active noise cancellation to clean up cabin noise, but lots of sound deadening keeps things relatively hushed inside. We haven’t seen a base Sierra or even a mid-line trim; test trucks in SLT trim make no quality excuses, while the low-key wood and metal trim and digital displays in the Denali strike deeply in a Cadillac direction. Behind the plentiful passenger space, GMC ties on a pickup bed that adopts some cutting-edge construction to deliver more usable cargo space. GMC says it can hold up to 20 percent more cargo than in past versions, thanks to a more compact bed wall that has up to 7 inches more space between the bed sides. Depending on the bed and configuration, GMC offers a dozen tie-downs, a cast-in foot step at the bed corners, LED bed lighting, movable tie downs, and a tailgate with lift assistance and power locking. If the usual drop-in and spray-in bedliners aren’t fancy enough, GMC will sell a Sierra with a carbon-fiber bed. Stronger and lighter than a standard steel or aluminum bed, the carbon box saves weight but adds an unknown amount to the Sierra’s price tag as of this writing. More useful for more buyers—and standard on SLT, AT4 and Denali Sierras—will be a new six-way tailgate. GMC calls it MultiPro; it can drop down with damped assist like a normal tailgate, but a center section can fold down to create a standing-height desk, with a flip-up barrier for longer items. The center section also folds down to create a nearly full-width step into the bed, or folds out of the way to make loading the bed easier. The step can hold up to 375 pounds—and it makes a great bench seat for tailgate parties. No crash-test scores exist, and the 2019 GMC Sierra limits important safety technology to expensive models. A new safety and technology structure means the Sierra can offer a host of new features unavailable on the older models. Along with the usual mandatory features, the 2019 Sierra can be configured with four-wheel drive. Trailer mirrors aren’t yet available for big towing visibility, but a new camera system gives a 360-degree view of the world around the pickup. With an accessory camera that mounts on a towed trailer, the Sierra also spins through camera views to provide a quick look at traffic behind the trailer, at the hitch connection, or at the contents of the truck bed. A rear camera mirror offers a clear view of the road behind the Sierra, but some drivers will need time to get used to the rapidly moving image. That said, the Sierra comes with updated safety tech that’s limited to more expensive models. Blind-spot monitors cost extra on every model except Denali. Forward-collision warnings with automatic emergency braking only come on SLT, AT4, and Denali trucks, and cost extra at that. They’re bundled with adaptive cruise control and active lane control. We’ll update this score when the NHTSA and the IIHS report on the 2019 Sierra’s crashworthiness. A trick new trailer camera system and luxe features tip the tech and price scales, but there’s a 2019 Sierra for most budgets. The 2019 GMC Sierra lineup eventually will include regular, extended, and crew cab models, turbo-4 engines and 6-cylinders and V-8s, 6- or 8- or 10-speed automatic transmissions, and a choice between rear- or four-wheel drive. The 2019 GMC Sierra comes in base, SLE, Elevation, SLT, AT4, and Denali trim levels. Every one comes with power locks, air conditioning, and an AM/FM audio system with Bluetooth audio streaming and a USB port, as well as Apple CarPlay and Android Auto compatibility. Base GMC work trucks have vinyl floors, cloth upholstery, an unlined bed, and the V-6 engine with 6-speed automatic. Options include LED bed lights, cruise control, power mirrors, and keyless entry. A better version for daily truck drivers is the Sierra SLE, which adds more USB ports, power mirrors, a lift-assisted tailgate and an 8-speed automatic; a power driver seat, keyless ignition, remote start, and a trailering package can be fitted. An Elevation trim level sports off-road appearance bits such as body-color trim, 20-inch wheels, and with an X31 Off Road Package, useful gear such as a locking rear differential, Rancho shocks, hill descent control, skid plates, and a two-speed transfer case for its four-wheel-drive system. It will be sold with the turbo-4, 5.3-liter V-8, and turbodiesel engines. Options range from power front seats to the trailer package. Our pick in the 2019 Sierra lineup comes in SLT guise. It gains automatic climate control, a high-definition rearview camera, satellite radio, a 10-way power driver seat, leather upholstery, LED headlights, and the six-way tailgate. It can be equipped with cooled front seats, navigation, wireless smartphone charging, premium audio towing and trailering packages, and heated rear seats. The off-road specialist Sierra AT4 truck gets a 2-inch suspension lift, a two-speed transfer case, skid plates, a locking rear differential, Rancho shocks, 18-inch wheels with all-terrain tires, and hill-descent control, as well as aluminum interior trim, two-tone leather upholstery, and a choice of V-8 or turbodiesel engines. The carbon-fiber truck bed comes as an option, but it’s not yet available; navigation, trailering gear, a head-up display, and wireless smartphone charging are available. At the summit of the GMC Sierra lineup, the Denali ladles on standard equipment. It has a standard digital display integrated in the gauges, front bucket seats with a center console, leather upholstery, chrome exterior trim, open-pore wood trim, and an 8.0-inch touchscreen with navigation. The latter system has a clean interface with maps that need more contrast between the drive route and other roads; its blue-on-green route readouts can be difficult to follow on the fly. Its options include power side steps, 22-inch wheels, a surround-view camera system, and a rear camera mirror. GMC also offers a trailer camera system that toggles through modes. With an accessory camera mounted on a trailer and connected to the truck, drivers can monitor traffic to the rear, the state of the hitch connection, even objects in the bed. It’s one of the Sierra’s trick new features that makes higher-priced models worth a long look. Gas mileage gains haven’t shown up on the 2019 GMC Sierra’s EPA scorecard yet. The 2019 GMC Sierra lineup hasn’t been fully fleshed out. So far, only the least fuel-efficient versions are available. Rear-drive Sierra with 5.3-liter V-8 and 8-speed automatic are EPA-rated at 17 mpg city, 23 highway, 19 combined. With four-wheel drive, it’s 15/21/17 mpg. The former’s only a minor improvement versus the 2018 model; the latter’s actually a drop in fuel economy, despite the Sierra’s extreme weight-loss regimen. The AT4 rates 15/20/17 mpg with that same drivetrain. With four-wheel drive and the 6.2-liter V-8 coupled to a 10-speed automatic, it’s 15/19/17 mpg, and so are other so-equipped Sierras. Again, those figures are roughly equivalent to or lower than last year’s model, despite a new 10-speed automatic and a weight loss of more than 350 pounds, according to GMC. The V-8 engines also have a new system which conserves more fuel by shutting off the gas to cylinders in 17 different ways. That means the Sierra can power anywhere from two to eight cylinders. It’s puzzling why the expected fuel economy gains did not materialize. 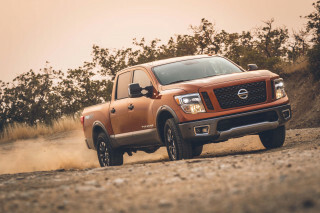 Left unrated as of yet are 6-cylinder Sierras, both gas and turbodiesel; a new 2.7-liter turbo-4; and the 5.3-liter V-8 with a 6-speed automatic. MSRP based on 2WD Reg Cab 140"
Looking for a different year of the GMC Sierra 1500?